THE Duke of Gloucester is a cousin to Queen Elizabeth II, but I’m afraid I have no connection with him and know very little about him. This post is about a steam locomotive named after him and seems to be known without a ‘the’ in front of Duke of Gloucester. The Duke was the last ever express passenger steam loco built for British Railways. It was turned out of the works at Crewe in 1954 and was not particularly successful. The Duke was the only loco built to that particular design and was withdrawn from active service after only eight years. Bits of the Duke were removed for display in the Science Museum. The bulk of the engine languished in Dai Woodham’s scrapyard until 1974. In getting the engine back into running order, faults in original manufacture were found. These were rectified and other improvements made. The restored loco was transformed, in terms of performance, from its earlier days. It has proved a competent and popular loco on special trains. 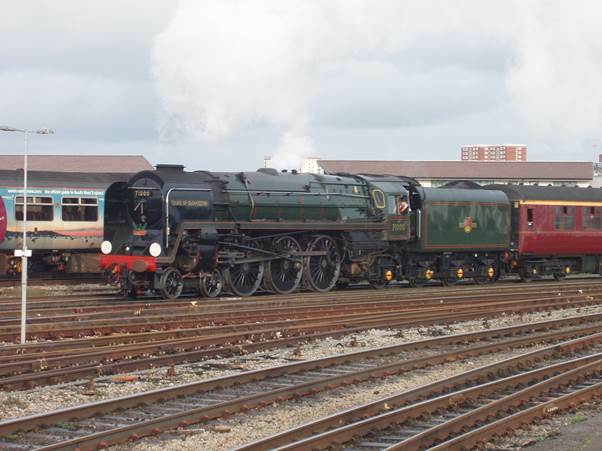 We saw it in 2006 when some close relatives were hauled by the loco to Bristol. 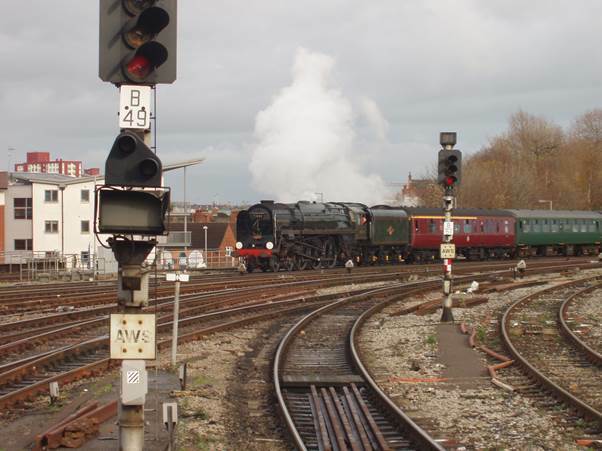 Here she (locos are always she, even if named after a Duke) is rounding the curve into Temple Meads, the main station in the West Country city. The Duke made for a handsome sight on arrival. Drawn up in the station. The Duke could take a breather. It was the end of November and well into darkness when The Duke paused at Trowbridge on the return trip. There looks to be steam to spare. That was a special day and starred a special engine.